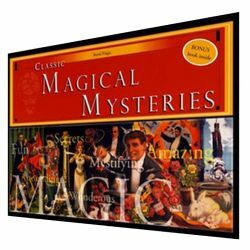 The Classic Magical Mysteries Magic Kit is the perfect introductory kit for aspiring magicians. This kit was designed by professional magicians who specifically choose tricks that have stood the test of time, are easy to perform, and yet are baffling to the audience. Inside the box you will find all the props as well as an instruction book on how to perform over 100 different magic tricks including card magic, money miracles, puzzles, and mental feats. Also included is an Instant Appearing Wand that can be used as both a trick itself and as a prop to aid in the performance of other tricks.